From Release: From hell they came… in April 1977 at the dawn of the punk movement, THE MISFITS were born. They wound up making history and creating a legacy that has truly withstood the test of time. 30 years on THE MISFITS are generating more interest than ever before. To celebrate this significant tombstone, THE MISFITS are going to fill your Christmas stockings with ghoulish delight because December’s exclusive Australia/ New Zealand tour will feature STATIC AGE and EARTH AD in full. THE MISFITS have been preserved on determination bound by unequalled loyalty to their fans and the sheer will to survive. 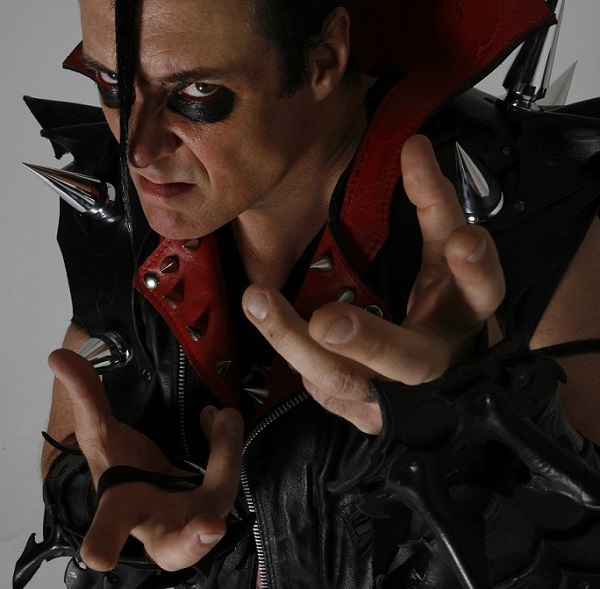 The ferocity and melody that has made THE MISFITS omnipresent and immortal sees the band continue to sell out shows and draw thousands of fans night after night around the globe. So come on out Fiends – All hell will break loose when the kings of horror-rock drag humanity by the throat into a world of darkness filled with ghouls, goblins and creatures of the night. Move over Saint Nick, because when THE MISFITS are in town every day is Halloween! Of course you’re heading back to Australia, for those who have never witnessed a gig of yours, what can people expect from a typical Misfits show? Well The Misfits is a very unique project, it has to do with a lot of physical energy and has to do with a lot of aggression, it has to do with some touchy subjects mostly horror and I think usually a good time is had by all. So I think what you really need to do is come with an open mind if you’ve never seen the band and participate and I think participation is really the key to having that combustion between that audience and the band. Australia has always been kind you and the band, what do you think it is about The Misfits and Australia that connects? I think that we have a little bit something there for everyone, I think that the Australians really see that The Misfits is something to not be taken lightly and to be something that has been worked on hard and well developed and it has a potential inspiring people to do great things and I think that people look at us and they find a piece of themselves in it and where they apply that all depends on who’s looking at it and from what angle. I think that The Misfits is as part of your culture as it is up here. Yeah I heard, rumour has it. You’ve been here before, so besides the gigs what’s your favourite thing to do in Australia? Let’s see… I tell you what I like working out in Australia *laughs* we’ve always manage to find a good gym and I think that we get to play around with the wild life a little bit and went to the Koala place and watched two Kangaroos slug it out, that was pretty interesting. I’m not much of a tourist, I apologize for that but we do like going fishing, we try and eat what we catch. I haven’t gone in Australia yet but I’d like to try that. Now throughout the band’s history, a number of Misfits have come and gone from the line-up, and with each incarnation or member, does this help to still fuel your passion for this band? Well I put it to you this way, it seems to me that there are people still that plot for an error and what that means is that somebody will get the opportunity to be in the band and they’ll come to point where there’s nothing else that they can put in for the band or they find something else that suits their fancy better. I think that everyone has been in the band has in one way or another come to the table of The Misfits and become a Misfit for that amount of time, I don’t think that anybody came in here and brought us something from another band that didn’t belong here in the first place. We had Marky come up from The Ramones, we did a couple of Ramones songs at that time, but at that time we also loved Johnny, Dee Dee and Joey so it was more of a tribute than anything else. I tell you what… Marky came in and he really didn’t fit into the horror thing that we were doing, I mean he played the songs ‘American Psycho’ and all those albums, he played that stuff well but he was more in the band during the time of the 1950’s album, so when that album came to be, Marky happened to be in the right place at the right time or maybe that it was that Marky was in the band that the 50’s album became the right thing to do at the time. So we try and make the right call at the right point in the road to further the band and to accelerate our image of where we wanna go, so in that case Marky was more of a jazzy kind of drummer and we did a 50’s record and he knew all the songs and that probably wouldn’t have worked with a different drummer. So I think each person had their purpose at the time. Now, it’s been four years since The Devil’s Rain, is there any thought to new material in the foreseeable future? We’re working on stuff right now, my son is in the other room right now putting a lead on the title track, well it might not be the title track I don’t know what I’m gonna call the record yet, it’s gonna be the first song on the album I can tell you that much. *laughs* we’re working on it, we’re got maybe seven or eight good ideas that we’re starting to put together, I’d like to have demos before we start the tour and I won’t be home after that so I’m hoping before I walk out the door that I have seven or eight songs that are on CD and I can listen to and start to refine them, because most of the time I’ll sit there and hum the lead because this is what I hear in my head and stuff like that. So yeah, we’re starting to work on it, we have a tentative release date of August 14th at Dracula’s castle in Transylvania when we play at the festival, so I’m trying to get my record done for August 14th at the latest. After so many years being in The Misfits, what do you still find enjoyable or satisfying about this band? I like the enthusiasm I think is the one thing I really like about it, I mean every day we wake up and we try to be the best band in the world, we get a little bit side tracked because I still work in a machine shop but my son picks up the slack because he produces the albums and stuff like that so he works in the studio while I’m working on machines making parts. So I mean that’s a good thing to have, we’re totally self-contained now and like I said I guess we’re looking at eleven months for a release date and we’re gonna have to dig, we’re gonna really have to come up with another eight or ten good songs in eleven months and have them recorded and ready to go and all packaged up and ready to go. So this is probably a bit of a push but you know what? We have the opportunity to play in Transylvania so I’d love to save that for a new album release. I’m working on it. In terms of a legacy, how will you want The Misfits to be remembered? I would like to say invincible… I think that would be more the word, I don’t want to be the biggest or most successful thing, I don’t want to be the most popular thing, I want to be the thing that you couldn’t kill… so when I say it now you say well yeah you guys have so much behind you and so much you’ve done so how could that ever be but I view our career as just beginning to hit its stride, I think that this line up with my son in the band and the amount of effort and the way we rehearse, the way we approach things, we’re doing double sessions we’re working in the studio for a couple of hours then we’re going and jamming because our drummer drives from New York up to upper New Jersey so he’s got a two and half hour ride to come and see us. We’ve got a schedule, we have a plan and I like that, I don’t like when things aren’t organised and things are just chaotic and no one knows what the hell is going on, I don’t like working like that I like working and knowing exactly what needs to be done when and we get it done and that seems to be what we’ve got going on now. As a big tattoo fan myself, I wanted to ask about the fiend skull and probably one of the most recognizable images in music, how many tatts of the fiend skull have you seen in your time? Oh forget it, my mother came up with a great idea, she said “You know, you should take pictures of everybody’s tattoo and make a table book” and I said “What a great idea” so we’re actually and I wanted to do that, my eldest daughter is a photographer and she just had a baby so she can’t come on the road but she can do that, we can have it so people walk in the door, there’s two lights set up with a black cloth and you put your arm or your leg up on the thing and we take your picture and write your name, what town you’re from and what country and you sign a release that if we decide to use it that we can use it. That’s it. That’s the book, how simple is that *laughs* really nice big coffee table book with everybody’s tattoos and we start with A – Arizona, Anchorage, Alaska, blah blah blah we just put all the tattoos in order A-Z and pick the best one from every town we play. Yeah forget it, you’ve got about five or six major cities there I’m sure we’ll be playing and we would pick a handful from each one, maybe a page for each city, that’s a cool idea like a collage, the best tattoo would be the centrepiece and the other tattoos around it and some worth showing, some people are gonna get pissed off you’re gonna have that problem and you can’t please everybody and you’re a fool if you try. Will be finishing a new album and launching a new band, we have a new band were launching, so we’ll be launching their album as well… ‘She Demons’ five girls, they’re gonna kill it, wait until you see them play. We’re mixing their record as we speak, their first mixes came in today and we’ll have a six song demo ready for tour they’re gonna be opening for us in The U.S. and after that we’re gonna finish their full length album and try and get them out on the road. Band members: Jerry Only, Eric “Chupacabra” Arce, Jerry Caiafa jr.